150 lb. x 0.2 lb. ; 68 kg. x 0.1 kg. Ensure that you're getting all of the food you pay for and cut down on waste with this Taylor TE150 150 lb. digital receiving scale. Ideal for checking weights during receiving, the Taylor TE150 150 lb. digital scale will serve as a welcome addition to your restaurant. Boasting a 150 lb. 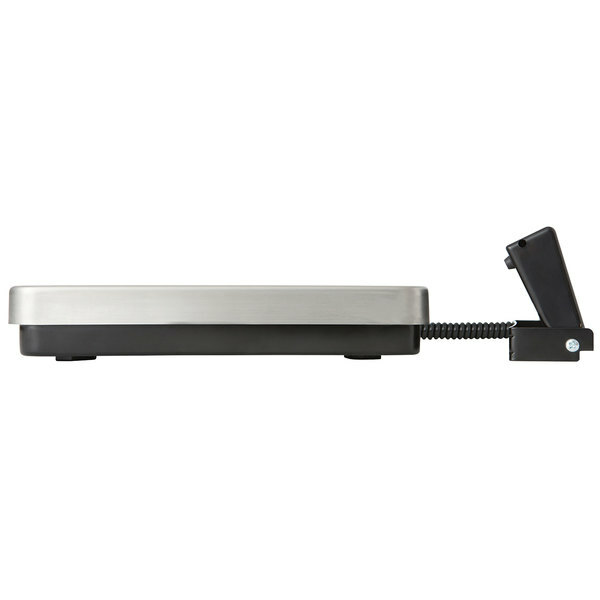 capacity and the ability to weigh in either pounds or kilograms, this scale allows for simple and effortless measurements each time and helps you to make sure you're getting the expected amounts of food with your delivery. "Works great!! Have used for a while now and the accuracy is fantastic!! Really easy to read digital numbers and great for inventory and large bulk orders." This scale is excellent for use as a receiving scale. It has a 150 lb. capacity and reads in lb. and kg. The scales readout measurements are 150 lb. x 0.2 lb. or 68 kg. x 0.1 kg. 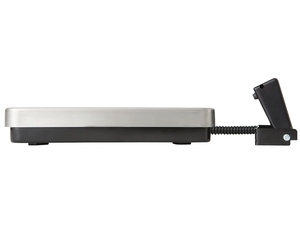 The stainless steel weighing platform gives you plenty of space for weighing and it is removable to make cleaning easy. This scale features an auto tare function, which deducts container weight and zeros out for multiple ingredient measurement. Auto hold locks the weight in and makes removal easier. Auto shut- off conserves battery power, and a low battery indicator mode prevents unexpected power loss. An overload indicator lets you know if the scale has exceeded its maximum capacity. The display's 1" design and bold characters make it simple to quickly tell the weight and move on to the next portion. 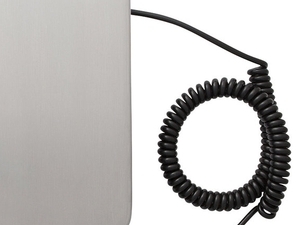 Attached to the remote display are non-skid rubber feet and a 6' coiled cord. This unit can also be mounted onto a table or wall with included mounting bracket and screws. 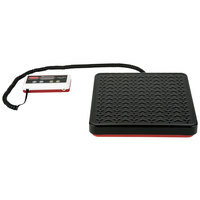 This scale can be used with the included AC adapter or with six AA batteries (sold separately). An auto-off feature and low battery indicator further help save power and alert you when you need to switch the batteries. If your supplier consistently shorts you on product, it can really add up over time. 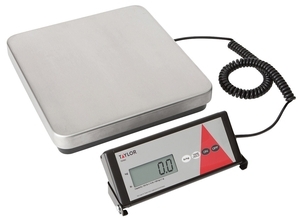 Protect yourself with the Taylor TE150 digital receiving scale! 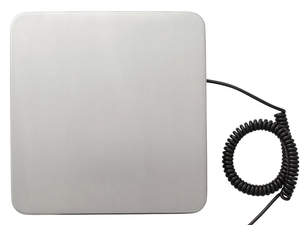 It features innovative functions such as a tare button, hold button, and customizable display. Since the food you buy is typically pre-packaged, and has the weights listed on the side, it’s easy to assume that you’re getting what you paid for, but vendors make errors. Not that any food vendor would try to take advantage of you, but these things just sometimes happen. 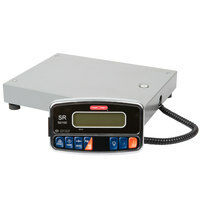 We have several models of receiving scale available with capacities from 60 lbs all the way up to 1000 lbs. 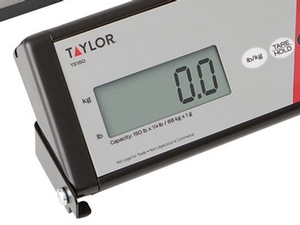 Today I’m going to be going over the use and function of the Taylor TE150 Digital Receiving Scale, which has a capacity of 150 lbs. When you first get your TE150 home, of course the first thing you’ll want to do is plug it in. You can see the spot for the plug is right on the back of the platform here. You can see that it goes right in there, and the other end goes into the receptacle. The great thing about the TE150 is that it’s very portable, and I’ll show you why I say that. You can take off the top of this platform, and you can see right here there is a battery compartment door. If I remove that you can see there is a spot for six AA batteries. That means you don’t even have to plug this unit in, and you can move it around anywhere. Allow me to put this back together. What also makes it portable is that on the control panel it has four rubber feet on the bottom. So you can put this on top of a table just about anywhere, but it does come with a mounting bracket. You would just mount these two screws in the wall or on your table, and then you line up this hole with the hole down here, and screw it in with the included screws. Then you can mount that control panel anywhere you like. Now let’s take a look at the basic functions of the Taylor TE150. Let me put some weight on here. All I have are some chocolate syrups so I’ll just use that for right now. You can see right here it comes out in Kilograms, but I can change that to pounds right here. You can see now that my chocolate syrup is 11 lbs. We can take a look, it also has a tare function, and so if I put my container on here, all you have to do to tare this out is just hit the “tare hold” key quickly. 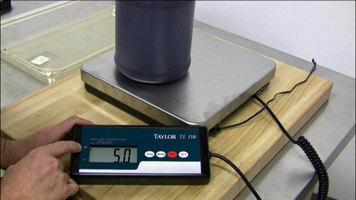 Then you can weigh your product very accurately without taking into account the container. The other function that this has is a hold function. Oh, when you do the tare function, you can see when you take the weight off you have a negative weight. You can fix that quite easily by hitting tare one more time. It also does have a hold function. To use that the first thing I’ll do is just press on this hold key for three seconds. Then it will say Hold on, or “H_on.” Here I will put my product on top, and now I’ll remove it and you’ll see that this weight remains. So if I need to record that weight I can have it up and look at it and not have to remember it. To clear this out, all I have to do is hit that one more time. If I want to cancel the hold function, all you’ll do is just press and hold until it says “H-oF.” That’s all there is to it! Now that you’ve seen how easy this is, think about what it would cost if you didn’t have a digital receiving scale. What if you are being shorted just a little bit each time you ordered? 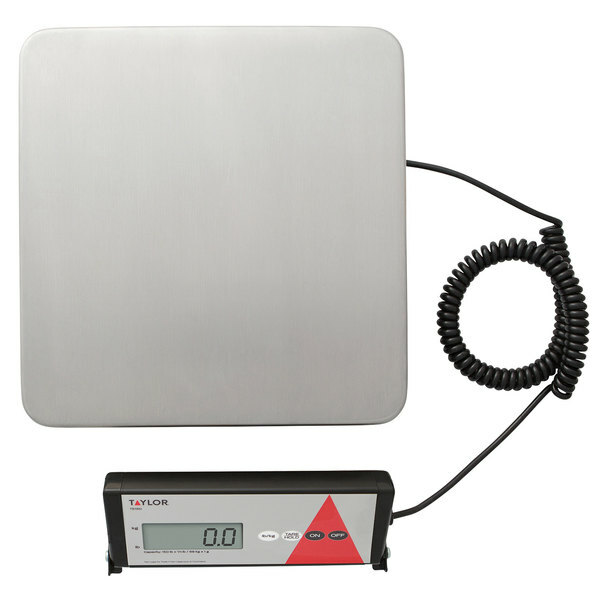 Knowledge is power, so put yourself in the know, and get yourself a digital receiving scale! Works great!! Have used for a while now and the accuracy is fantastic!! Really easy to read digital numbers and great for inventory and large bulk orders. 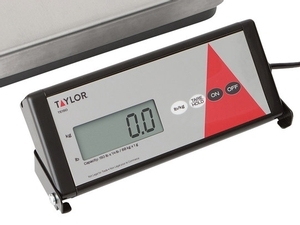 if you are looking for a digital scale that is accurate and easy to use as well as easy to clean then look no furthter than the Taylor TE150 150 lb. 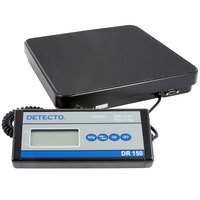 Digital Receiving Scale with Remote Display. its precise and makes any job simple and quick. 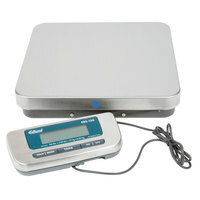 The scale is precise, easy to read, easy to use, easy to clean, and easy to store. The remote display is perfect for keeping on the shelf above the mixer. It's a very good scale for weighting the product. It didn't last long. The on/off switch broke and won't stay on. The scale is still relatively brand new. Just disappointment on the quality of the scale and short warranty already ran out. This scale is ideal for my restaurant easy to use and it is also always right on point. May need to get another one soon I will I am sure! This scale is perfect for weighing your incoming product! Easy to read screen and different unit options allows for optimal usage! Don't get shorted on your food orders! This is an ideal scale for any restaurant! you should always be weighing and checking in your shipments. Great for weighing out sub primal cuts of beef. This is a great scale for checking the weights of bulk protein items! Great for scaling bulk amounts of ingredients for banquets as well! Works well!! Great brand! This scale is very good for many situations. A good use for this scale is for measuring out very high amounts of ingredients for large batches. 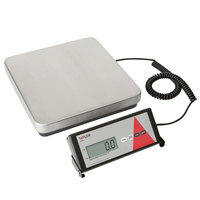 This is a nice heavy duty scale that we use to weigh flour for dough making. It is not very water friendly, so keep it dry. Item works great. We use it weekly for inventory and the kitchen loves the ease of it. Would definately purchase another one based on need.